You have entered Wood Carving Macedonia, a website of the wood carving artist Mr. Vinko Bogdanoski ('High Hills' Wood Carving Studio). This is a homeland of wood carving, chainsaw carving, kopanicarstvo, rezbarstvo, rezba. It's all about pure art. We hope that you'll find something interesting at this pages. If you want to be proud owner of some unique wood work made by the Macedonian woodcarver Mr. Bogdanoski and his team, just contact us. It will be our pleasure to satisfy your needs. A year after the Macedonian woodcarver Vinko Bogdanoski started to practice chainsaw carving, he decided to take part at the 13th Annual Oregon Divisional Chainsaw Sculpting Championships (held in Reedsport, Oregon, United States of America). Arriving short before the start of one of the biggest world chainsaw carving competitions (ODCSC 2012), Vinko had just little time to meet the Reedsport event rules and surroundings. During the competition days (June 14-17, 2012) Vinko took part at the main event as Pro Carver + in fast carving discipline. He worked at the wooden sculpture of four United States presidents (Mount Rushmore sculpture; main chainsaw carving event), and few smaller sculptures (fast carving). Those few days were great experience for him, since he had chance to meet the best world chainsaw carvers, but also to see their skills. After the event Vinko stayed few more weeks at Reedsport, where he made few new friendships (Mr. Bill Karcher, local carvers and Reedsport residents), but also explored the tradition and culture of this part of the American continent. He worked some time with the local carver Tom Castaneda (The Rusty Frog Gallery), and got big chainsaw carving experience, made various bears’ sculptures and benches with wild animals. Those few weeks spent at the American west coast were quality spent time for Vinko. It opened his new visions for chainsaw carving, get him deeply into this branch of art. Before Mr Bogdanoski left Macedonia to be part of Oregon Chainsaw Carving Event 2012, and after his return – he made few new wooden sculptures through chainsaw carving at his “High Hills” studio. Check out Carving Photo Gallery No.4 to see: wooden sculpture of the late US president George Washington, dolphins wood sculpture, wooden benches with bears and deers, but also some company logos and welcome signs. Almost a year since we started practicing chainsaw carving at High Hills studio, we made good amount of various chainsaw carvings. Some of them were big (over 200 cm in height), some smaller, however – we were excited to create wooden sculptures in this, new for us, branch of carving. As a tools, we primary used chain saws from STIHL and Husqvarna , but also various chisels, knives and other wood carving tools – for the final touch. You can see most of the wooden sculptures we made in our latest photo gallery (Wood Carving Works Gallery No.3). Except the carvings made through chainsaw carving, recently we also carved: wooden company logos, hunting trophies, welcome signs, souvenirs. – Link: Photo Gallery of Wood Carving Works No. 3 (wooden sculptures, chainsaw wood carvings, totems, souvenirs, company logos and brands, hunting trophies, welcome signs). If you like to own beautiful wooden sculpture – contact us and tell us all about it. Our website and its articles are written in English. However, the visitors have the opportunity to translate all posts and pages in their language. Many of our clients interested in wood carving works come from the Republic of Macedonia (Makedonija), so we decided to create a carving page just for the Macedonians. At this single page at WoodCarvingMacedonia.com they can read the story behind Mr. Bogdanovski, his team, and “High Hills” woodcarving studio. Also, the wood works and services we offer, and how the customers can contact us. The link to the Macedonian page is available in the sidebar and footer of the site. 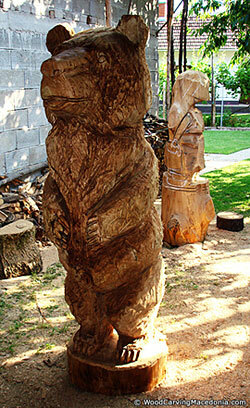 Since May 2011 we started to practice chainsaw wood carving, i.e. creating big wooden sculptures using chain saw as a main tool. Usually we use chainsaws from STIHL and Husqvarna. So far, few sculptures were made (totems, wild animals, company logos, etc). We noticed people are very interested in this new kind of woodcarving works we offer. Looking forward to explore this area of chainsaw carving more deeply, and deliver many beautiful sculptures through it. The team behind High Hills woodcarving studio decided to offer discounts on their wood carving works. The discounts are available for individuals who will order more than one wood carving work. 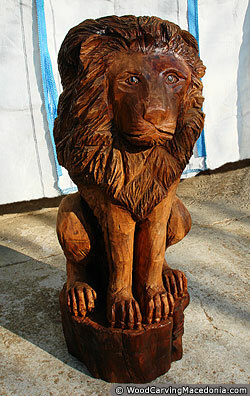 Also, companies/firms/organizations who order big amount of wood carving works get solid discount. This offer is valid until the end of August 2011. If you are interested – contact us. Let’s turn your idea into a beautiful wood work. From the start of “Wood Carving Macedonia” website, our photo gallery operates as slideshow Flash gallery. Since some browsers, mobile devices, etc, doesn’t support Adobe’s Flash technology, we decided to build a plain photo gallery, too. Now, you can choose to browse the photos of wood carving works, process, tools and materials, as plain or flash gallery. Mr. Bogdanoski and his team at ‘High Hills’ wood carving studio hopes that this move will make the site more user-friendly. Check out the new plain photo gallery. 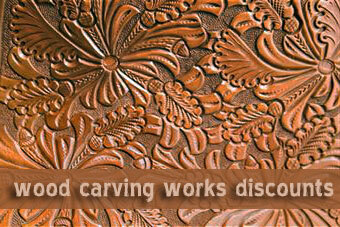 As in the past, we will continue to publish useful articles for wood carvers, under the name “Wood Carving Articles”. These articles are some kind of tips and tricks that help woodcarvers (beginners and veterans) on their way to build masterpieces in wood. – How to begin? … Useful advices for the beginners. – What kind of wood to use? … Not all kinds of wood are good for processing. – What tools are the best? … Where to find them and how to use. – Where to find buyers? … Don’t have an idea? We have the answers. Follow us, get deeply into the world of woodcarving.